The routeword puzzle has a selection of different names, but the rules of the puzzle are as follows: Simply answer each of the crossword-type clues. However, rather than having numbered clues across and down, rather you start at the top left of the puzzle and work round clockwise, getting gradually to the center of the puzzle. In addition with the routeword puzzle, clues share letters. The first letter of the second word is the last letter of the first word and so on, so you will find that the total number of letters in the answer words is actually larger than the total number of squares in the grid! Routewords make a fun variation word puzzle for a compilation puzzle book, and can also make a good puzzle for children as they can be made quick easy with simple clues, and the way the puzzle works is also appealing. Of course puzzles, can also be made difficult and larger for the adult audience. 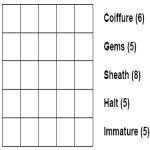 Click to view a sample Routeword puzzle in PDF format; this particular puzzle is on a 5x5 grid in size and is therefore a fairly small routeword. All puzzles for publication come in your choice of PDF or EPS format and can be customised as per your requirements if you have specific sizes, fonts or colours that you require for publication.